A new volcano could pose a threat larger than last year’s air-traffic paralysing eruption in Iceland, according to experts. Seismologists are nervously watching rumblings beneath a much more powerful Icelandic volcano call Katla, which could spew an ash cloud that will make the 2010 eruption look tame by comparison. This entry was posted in Iceland on 2011/10/16 by Trailsurfer. 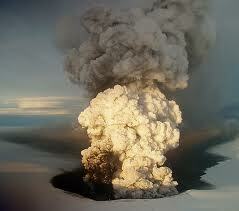 European airspace could be affected by a new wave of volcanic ash carried over from Iceland, it’s been predicted. 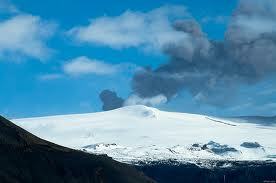 Previously Eyjafjallajökull Volcano was the culprit now it’s Grimsvotn which, on 21 May, began pushing out smoke and lava. If the volcano gains strength events of April 2010 could be repeated, with the worst case scenario being another ban placed on commercial airline operations. Since the eruption a 120 mile-wide no-fly zone has been imposed. Keflavik International Airport, Iceland’s largest, is not in operation for the time being and other Icelandic airports could follow the same lead. This entry was posted in Iceland on 2011/05/24 by Trailsurfer. Iceland has opened a museum dedicated to the Eyjafallajökull volcano, whose ash cloud brought air traffic grinding to a halt a year ago and forced stranded tourists to find other transportation. Stories of 3.000 euro Taxi rides where not uncommon. The volcanic landscape around Eyjafallajökull is now safe and open to those who want to see the dramatic changes the ash cloud caused to the area. These include the spectacular Gigjökull glacierfall, which formed from Eyjafjallajökull’s melted ice cap and the striking black and white glaciers. Tourists can also journey to the eruption site, 700 metres above sea level, for panoramic views over volcano tops and the Atlantic Ocean. A new exhibition centre opens on April 14, the anniversary of the eruption, at a farm, which lies at the base of Eyjafjallajökull. This entry was posted in Iceland on 2011/04/05 by Trailsurfer.